My copy of Wallenstein finally arrived today. This game has been on my list of “dream” games but I never thought I’d ever own a copy. Copies routinely list for $100 USD or more and I just couldn’t bring myself to pay that much. However, a couple of weeks ago I received a trade offer for my new copy of After the Flood for his copy of Wallenstein. I couldn’t pass that up. AtF is a game I received free due to an error at TreeFrog, it most likely wouldn’t get played since it’s a longer game for exactly three players, and it lists for $60 new. 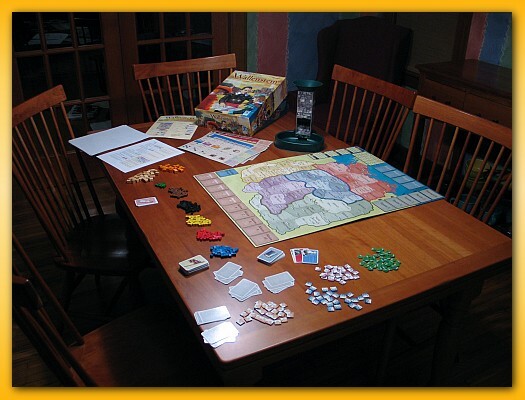 Wallenstein is an area control game for 3-5 players that lasts 2-3 hours. 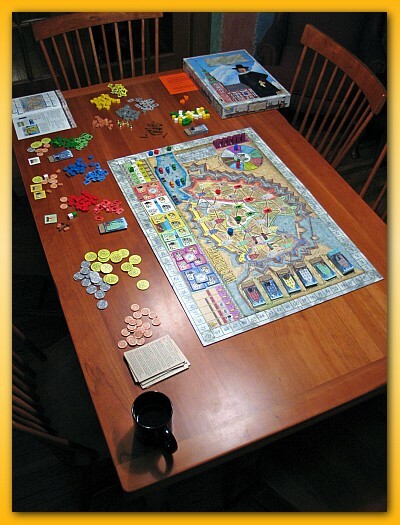 It’s a bit long for my group but it has been compared to El Grande which my group does like. The game is printed strictly in German but there are a lot of player aids and translations freely available on BGG. The game was also recently rethemed and reprinted with some rules modifications as Shogun. Ranked 7.78/10 and the 38th highest game on BGG means you’re looking at pure gaming pleasure in that huge box. Listed at 3.38 on the weight scale, Wallenstein sits somewhere north of El Grande and La Citta but slightly south of Reef Encounter and Tigris & Euphrates. Nice. A few things I like about the game are its variable phase order (turn order is different every round) and the simultaneous action selection (players simultaneously choose actions and then play out the season with those choices). Somewhat akin to Himalaya and Maharaja, part of the game is planning your strategy but taking into account what your opponents are programming into their set of moves. But most of all, you have to love the cheesy cube tower. 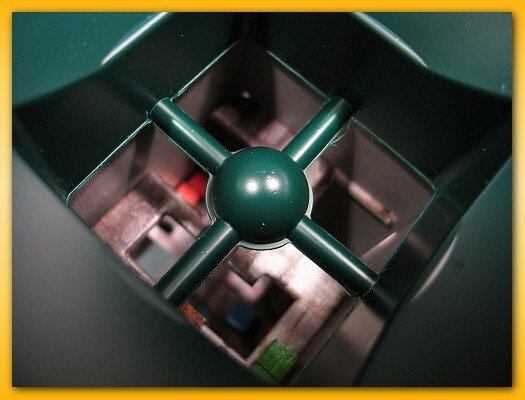 The “battle tower” is a gizmo that accepts cubes (your armies) and spits out the results of the battle. Internal to the tower are small ledges that trap some of the cubes so if you lose a battle this turn, you may win later when other cubes knock more of your cubes out of the little nooks and crannies. I’m looking forward to jumping into the rules and enjoying my “trophy” game even if it never gets played. Now if I can only find a spot on the shelf the gigantic box! 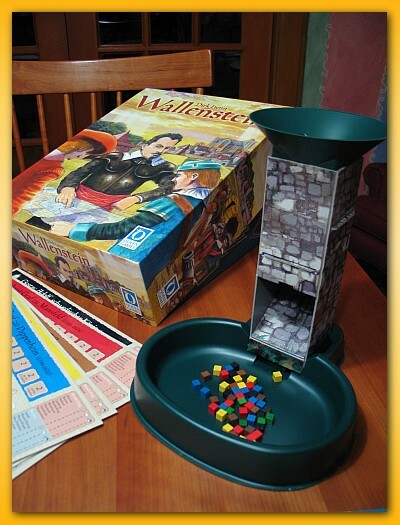 Bruno Faidutti has a nice write up on Wallenstein for his Ideal Game Library. Check it out if you get a chance. BGG.con’08 Game Library from Simon Hunt on Vimeo. From Aldie’s comments on Facebook, most of these games are from his collection and they applied a bar code to each box and had a scanner for check out/in during the convention. I’d really like to go next year. After making my way back from CodeMash up in Sandusky and with the weekend filled with some icy weather, I of course starting back into my gaming hobby. Well, to put it more accurately, I got back into my game-rule-reading hobby. I’m sort of like a sports aficionado that watches and follows football, basketball, or baseball but never actually plays. This post will be a summation of some games I’ve played and read about over the last few weeks allowing me to tick off a couple in my unplayed list. First up is Red November. Lisa, Noah, and I took our chances as a rag tag bunch of drunken gnomes trying to save the doomed sub. We actually won relatively handily but we did have some extremely lucky rolls when rooms were catching on fire. We kept rolling rooms where fire or water already existed so fire wasn’t a big problem. With little fire, we didn’t churn through the deck very quickly (using up grog and having to perform faint checks) and managed to make the Kraken a non-issue when it got shuffled into the deck. In this cooperative game, players work together trying to move around the sub fighting issues that keep popping up (e.g. fire, lack of oxygen, flooded rooms, blocked hatches, reactor going critical, Kraken, etc.). 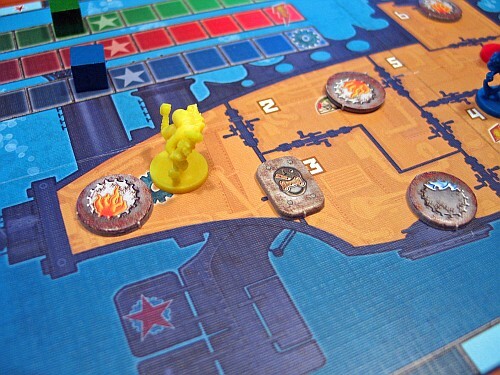 With a Thebes-like component, players spend minutes moving and taking actions and the player in ‘last’ place on the time track is the current player. As players move forward they trigger cards to be flipped up naming the next event occurring on the sub. With more players, more bad things happen but there are more people available to fix things so it supposedly works out. However, with three it didn’t seem like it was very difficult to win. I read through the rules of Tempus and I have to put it on my short list of games to play soon. 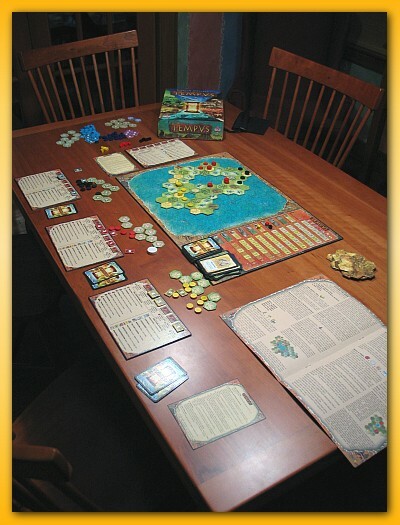 Tempus is a Martin Wallace title from 2006 but has a more Eurogame feel to it than his more recent Treefrog games. With a somewhat La Citta feel to it, players vie taking actions across numerous rounds to build cities and move their population discs on a map of various terrains. Each round decreases limits on what players can do during an action (e.g. have far discs can move on the map) and doing well in one round may allow you to advance one level beyond other players giving you an advantage. However, the end round catch up rules makes sure that you can only be one level behind the leaders. Tempus has a modular board that makes the layout of the tiles and the arrangement of the terrain different every game. This relatively unique feature should keep the game fresh. The game encourages attacking neighboring cities so directly player interaction is encouraged although have often it occurs is yet to be determined. I pulled out Hamburgum this evening and whoa…no wonder this game is expensive. There are more bits than you can shake a stick at plus there’s a double-sided board. First off, the game features box art that has to be the most horrible example of game art I’ve seen. It’s horrendous. The game however is pretty darned neat. Players produce, buy, and sell goods; build ships, donate to the building of churches, and building buildings. The game has a nifty turn mechanism called “the rondel”, a circular list of options. Players move their token in a clockwise fashion around the rondel (the first three moves are free) and where they land they get to take the action depicted on the rondel. I’m still in the middle of absorbing the rules but it seems like a pretty decent game with relatively meaty rules giving a slightly heavier feel; a thinky game. I do fear that my group may not like it due to the initial rules complexity but at 75 minutes and for 2-5 players…it’s just got to fit somewhere, right? Last up is the card game Dominion. I didn’t have the game on my wishlist because I’m not usually one to like card-based games featuring cards with a lot of text on them and this game comes with 500 cards. However, Lisa got a copy for me for Christmas and after a couple of 2-player games…it’s a winner. The game is relatively simple. 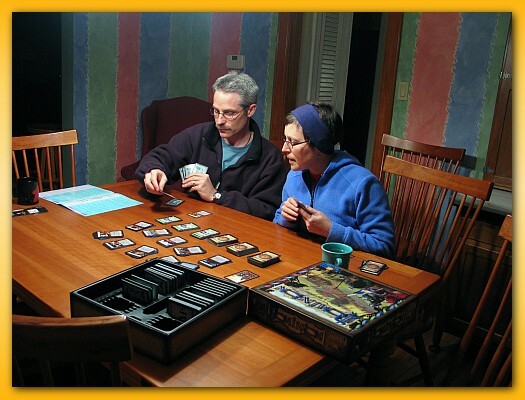 Game setup requires 10 types of action cards (out of the 25 types) to be placed in the middle of the table. Along with those 10 types, three denominations of money, and three denominations of victory points are added. Depending on what 10 types of cards are selected, additional cards may be used (e.g. Curse cards). Players are dealt 3 1-point victory point cards and 7 1-dollar cards for a starting hand of 10 cards representing your initial ‘deck’. Each player shuffles their 10 cards, draws 5 cards from the deck making your ‘hand’ leaving 5 cards in your ‘draw’ pile. A turn is dirt simple, from your 5 cards in your hand, select one of more action cards to play (you get one action play for free but other action cards allow for chaining action cards together) taking the action on the card. You then lay any additional money you have left in your hand and make a purchase from the cards in the center of the table (buying an action card, money, or victory points). You place new cards in a discard pile along with your played cards and and cards you have left in your hand leaving you with no cards in your hand. You then draw 5 more cards from your draw pile and wait for your next turn. After a few turns you’ll start amassing more cards in your deck and when you cannot draw 5 cards, you shuffle your discard pile and finish up drawing from the draw pile. The game is pretty neat in that some action cards allow for drawing more cards into your hand, exchanging cards, getting a card for free, grant you the ability to buy more than one card, cause other people to discard cards, act as additional money during the buy phase, etc. and given which 10 action cards you select for the game can drastically alter what strategy is necessarily to succeed. The game comes with a half a dozen recommended groups giving the game a specific feel but you can just randomly choose 10 if you want. There seems to be an extreme amount of variability in each game and I’m very excited about how easy it is to teach the game. Your first game will last a bit longer but once you get the hang of it I can’t see a game lasting more than 30-45 minutes. Having almost purposefully ignored this game, I’m pleasantly surprised and look forward to my next game. Okay…my list is getting bigger so something has to give. It’s either I have to stop acquiring games or somebody has to help me get them played. After the FloodA Martin Wallace game for exactly three players. A little on the long side at 3 hours but I’ve liked the other Tree Frog games to this point so I’m itching to play. Three only is going to make it a tough on a standard game night. I’d have to organize a special night for this title. In the Shadow of the Emperor2-4 players vie to become emperor by influencing the electorate. I traded for this a few months back and even with good reviews I’m struggling to stay excited about it. Saint PetersburgA card drafting and hand management game for 2-4 players. I don’t know what’s keeping me from cracking the shrinkwrap. Apparently, there exists a rather single path to victory but I’ve refrained from reading what that is in hopes of playing it enough to learn it for myself. Rails of EuropeA Railroad Tycoon expansion with a tighter European map and some small rules modifications. Lasting 2 hours for 3-5 players, it’s on the long side for my game group but I do have some Tycoon fans that might appreciate it. Tinners’ TrailAnother Wallace game I’ve mentioned numerous times before. There it sits on the shelf mocking me. I love the mining theme and just need 2 or 3 more friends to enjoy it with. HamburgumThe rather ridiculous looking box art hides a supposedly good game. I just received this title as part of my BGG Secret Santa gift so I can’t complain about it gathering dust. Listed as lasting 75 minutes for 2-5 players it looks like a perfect fit for my group. I just need to hide the top of the box. Man…that’s some crappy box art. TempusAnother BGG Secret Santa gift this year. I’m rapidly becoming a Wallace fan it appears! With a modular board, an action point system, and area control…what’s not to like. I just need 2-4 more people to spend 75 minutes with me. Red NovemberCoop games seem to be the new fad and Red November brings a lot to the table in a micro-sized box. Drunken gnomes fight all kinds of nasty things going wrong on a sub and it the job of 3-8 players to work together to fix them or everybody dies. The game has an interesting twist on turn order employing a Thebes-ish style of play where the active player is the player whose “ghost time token” is farthest back on the time track. You may take a turn multiple times until you’re no longer in “last” place. Noah seems interested in this title so I may get an opportunity to play this sooner rather than later. YspahanAcquired a few months ago, I just haven’t found the right opportunity to get this dice-based game to the table. 2-4 players compete in this dice-fest for 75 minutes. Hmmm….maybe I should have passed on this title. New EnglandPurchased used but unpunched back in October. Read through the rules (kinda) once but it didn’t immediately click so back on the shelf it went. It’s an auction/bidding and tile placement game for 3-4 players lasting 90 minutes and it gets good ratings so it should work for my group. So why hasn’t it seen the table?